With close to one hundred properties worldwide, The Ritz-Carlton has become a household name in luxury travel over the past three decades. Their guests are artfully cared for by the highly trained onsite Ladies and Gentlemen and the properties themselves are designed to showcase the unique culture of each location. This attention detail is reflected beautifully in their digital marketing communications. 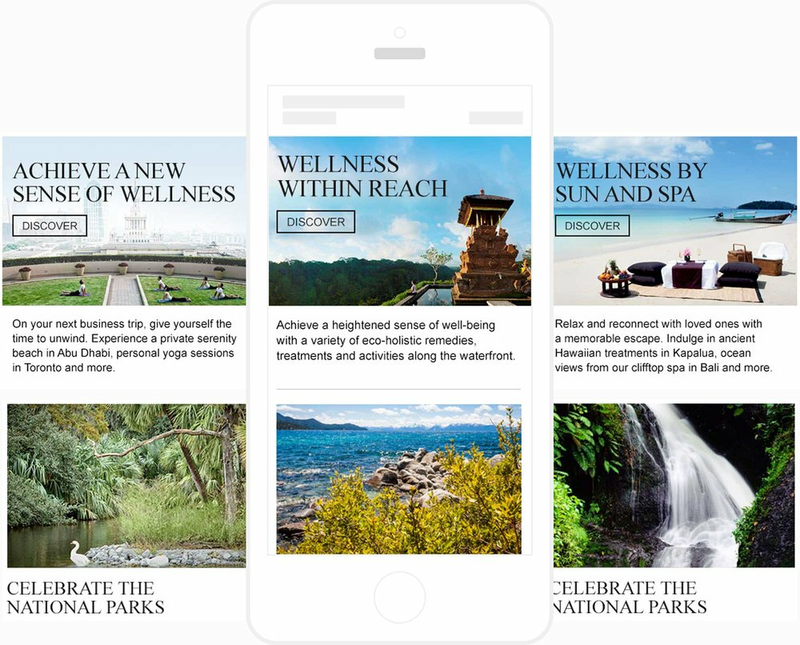 We've been lucky to help them drive engagement with potential guests through emails designed with elegant refinement and optimized with deeply researched user segment personalization. For brands build around world travel, an effective digital newsletter is an exceptional was to communicate with an engaged audience. In a single communication, you can inform potential guests on new property features, provide insight on future destinations and deliver personalized recommendations based on customer data and travel trends. 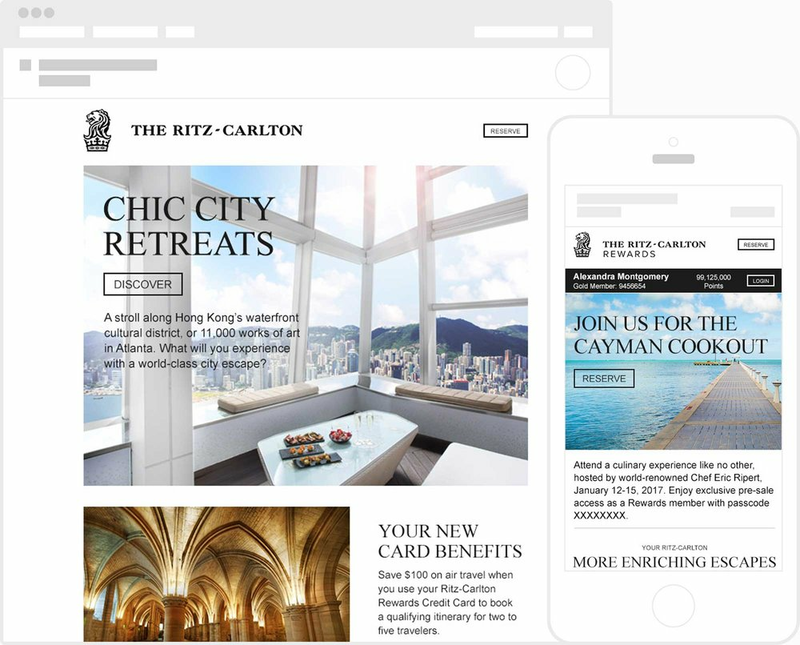 We redesigned and developed The Ritz-Carlton eNewsletter in a stylishly minimalistic layout that provides optimal flexibility and allows highly segmented content to shine. The beautiful locations are the real stars and we needed to a produce an incredible way to showcase them. Almost every piece of content in each send has dynamic versioning dependent on user preferences, previous stays, viewing environment, geo-location and of course loyalty status. Best in class HTML techniques, such as inbox-safe text overlays using VML code create, an efficient and lightweight file that's perfect to travelers on their mobile device. To help reach the individual needs of a potential Ritz-Carlton guest, users are segmented into distinct personas. Almost every newsletter feature is altered to serve up the most relevant content to the right user, at the right time. Whether they travel frequently for business or once a year for an anniversary, the content adapts to display alternative imagery and messaging. Rewards members are presented with even more data influenced content to ensure that extra level of engagement. Well styled creative and beautiful imagery are important, but content is always king. Our team worked to build out months of content recommendations based on seasonal trends, travel insights and user generated guest experiences. Acting on these recommendations, we could develop art and copy knowing it was part of a much greater content plan. This sort of approach makes every newsletter unique but also part of a much larger holistic and long term user experience. A Ritz-Carlton Rewards membership comes with plenty of exclusive amenities but the most avid guests always use their Rewards Card Credit to maximize their stay experience. On a bi-monthly cadence we were tasked to engage potential new card owners by showcasing it's benefits in exciting and unexpected ways. For a communication where the sole call-to-action can typically be "Apply Now", we used this blank canvas to explore the boundaries of inbox technology and user experience. Almost every send includes a unique creative strategy, different storytelling method and advanced inbox HTML techniques. We explored new engagement methods such as showcasing beautiful hi-def destination imagery through an edge-to-edge CSS background carousel, teasing potential luxury experiences through an interactive kinetic layout and providing a surprising user experience with horizontal scroll interaction. As the inbox experience continues to play catch up with a true web experience, kinetic CSS technology is starting to change the way users interact with their emails. Though surprising at first, users have quickly caught on to the idea of interactive slideshows, hotspots and other web styling in their inbox. We used this technique to highlight the variety of experiential possibilities that come with a Rewards Credit Card, letting the user explore their way through the story. User testing was crucial when producing this type of messaging, helping us to troubleshoot any unforeseen UX hurdles. The reflexive act of scrolling down through an email is as expected as anything can be on a digital device. To help disrupt a users typical and methodical email experience, we delivered a communication that scrolls left-to-right horizontally in both desktop and mobile inboxes. To tell the story of a card owner's journey, we knew navigating this message the way one would read through a horizontal timeline created an experience that was both surprising and intuitive. Like many luxury travel brands, The Ritz-Carlton's digital marketing is built around the customer experience and loyalty. Keeping the brand top of mind to a potential or returning guest is critical to building that lasting consumer relationship. Through a detailed lifecycle communication path and triggered automations, we helped drive that brand story with a robust welcome stream, Rewards redemption and level achievements, birthdays, anniversaries and everything in between.